Just as the Todai-ji Temple in Nara is as different as night and day to the Senso-ji Temple in Asakusa, a bowl of ramen made in a home in Kyoto could be just as varying in color, look, and taste as a bowl made by a family in Tokyo. 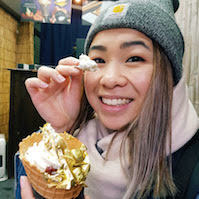 When people travel to Sapporo, they want their bellies filled with mountains of jingisukan (grilled dish typically consisting of mutton or lamb); when they visit Osaka, they head straight for the longest lines for piping hot takoyaki balls; when they land in Hiroshima, it’s straight to Okonomimura for a taste of the region’s unique version. Welcome to Japan, where unanimity in the ‘best’ choice of ingredients for any particular national dish varies from place to place, and every region loudly and proudly has something to call ‘theirs’. That’s the reason why many people ask the locals what is the best food in Kyoto. If you’re visiting Kyoto anytime soon, you’re in for a treat. 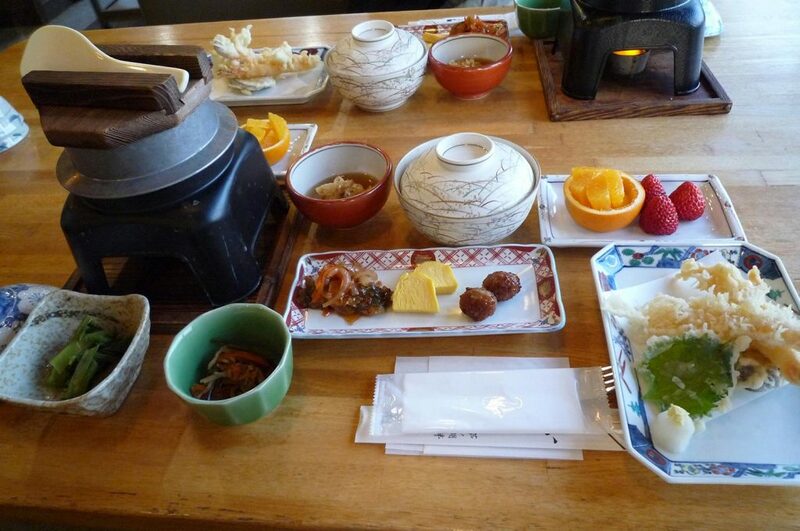 Not only is traditional Kyoto cuisine scrumptious in nature and wide in variety, but most of it is super healthy and won’t have you stomach working overtime to digest. Below we’ve outlined the top five best food to try in Kyoto, but if you’ve got some unique recommendations of your own, we’d love to hear it! 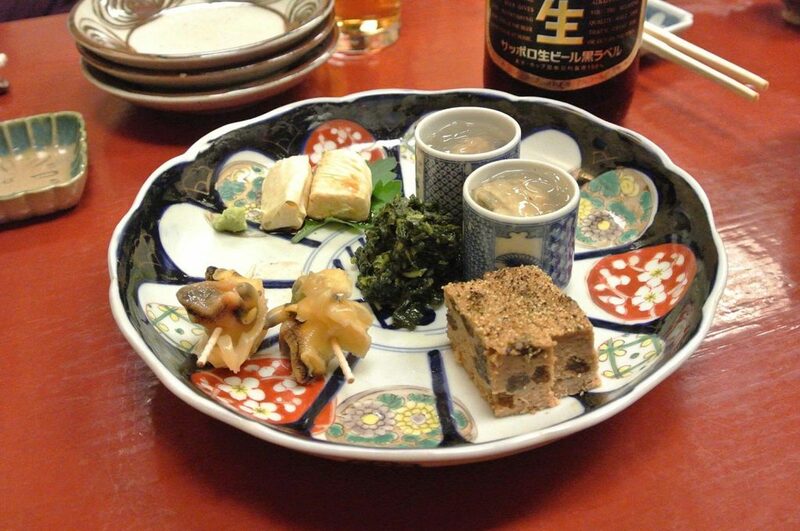 One of the most popular Kyoto dishes, Shojin Ryori actually originated as a Zen temple vegetarian cuisine develop by the Buddhist monks. This meal is entirely devoid of any animal meat (naturally); instead, it is primarily based on wild mountain plants, soybean-based foods, fresh vegetables, and various seeds and nuts. Due to the simplicity of the cooking style, which uses only sprinkles of shoyu, miso, sugar, rice wine and kelp stock, the lack of strong seasoning allows for the natural taste of the fresh ingredients to shine through. 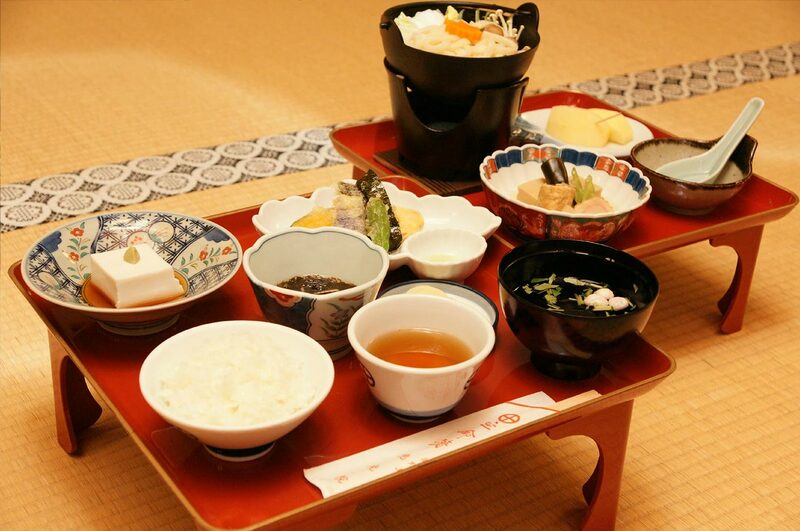 Most places offering Shojin Ryori will (more often than not) have between four to five dishes completing the set. This could include a soup, rice, pickles, and a few other side dishes. Although this may seem like an over-abundance of food, with the lack of excessive seasoning and oils used, the vegetarian dishes allow you the breadth of a buffet at the expense of less than half the stomach space. 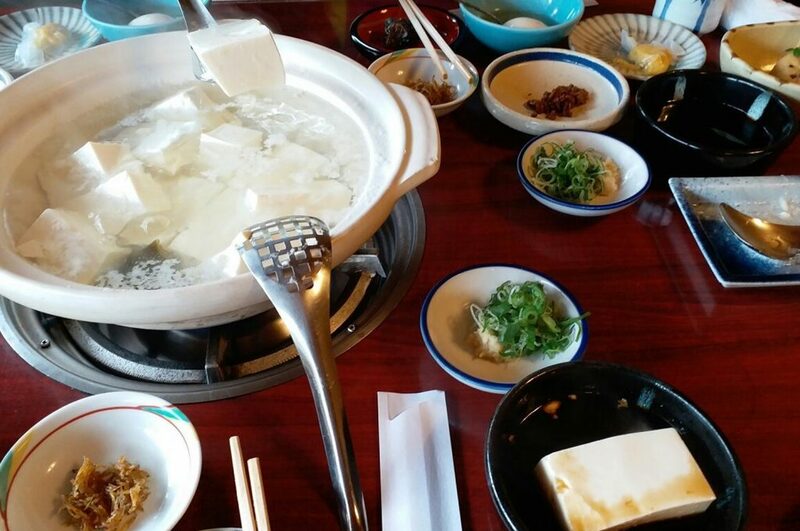 If you want more of this kind of food, you can check out our list of Healthy Japanese Food. 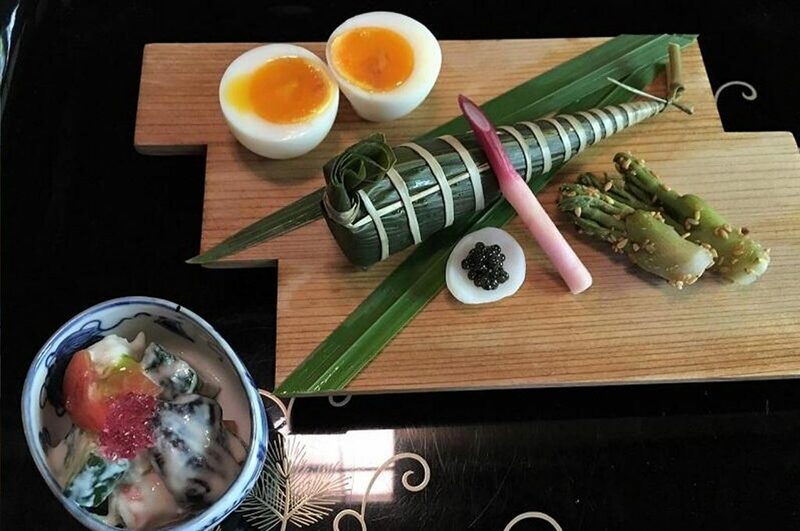 Located on the grounds of Tenryu-ji Temple, Shigetsu allows you to try authentic Shojin Ryori cooking without any compromise on taste, texture, or ingredients. With garden views of Tenryu-ji Temple in the background, what could be more perfect than eat the best food in Kyoto with an incredible view? Access: Head to Arashiyama Station. It is a 5-minute walk from there. 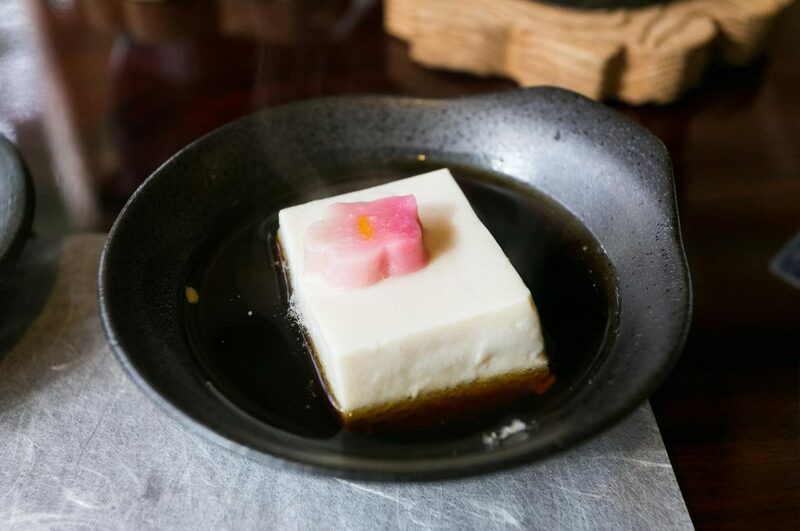 Yudofu is within the same family as tofu and is made with only three ingredients: water, silken tofu, and kombu seaweed for flavoring. However, it is not to be confused with tofu. This incredibly simple yet flavorsome dish is particularly unique to Kyoto, as the superior quality of pure Kyoto water and soybeans are what makes yudofu what it is. This dish passes on any heavy seasoning, and instead, produces a soft, smooth, creamy texture that always tastes clean and fresh. Yudofu is typically served in a small number of ways, including in a bowl of simple broth with minimal kelp and dried bonito flakes, or in a broth with simple, seasonal vegetables, or in a light kelp stock seasoned with tangy ponzu sauce and ginger, or simply with freshly sliced green onions, ground sesame seeds, and a light soy dipping sauce. Yudofu Sagano is located in a former temple district, hence why you will feel the Zen even as you enter the grounds. The restaurant itself is a quaint piece of architecture that transforms you back to olden-day Japan, and you will feel at peace amongst the perfectly placed traditional décor. Access: Head to Arashiyama Station. It is located 10 mins by foot. Kaiseki Ryori is essentially a set of multiple small dishes designed to be eaten in a particular way or to highlight a certain aspect of the meal (more often than not, this is the tea or the sake within the meal). It originated from Japanese tea ceremonies and was traditionally a cuisine for the aristocrats. 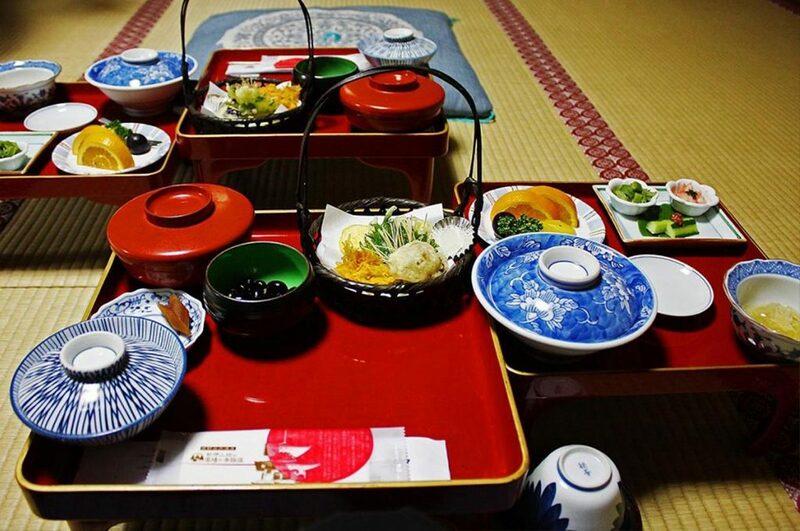 However, these days there are many restaurants around Kyoto serving up traditional kaiseki meals, and most ryokans offer the opportunity to stay and dine with a kaiseki dinner option. 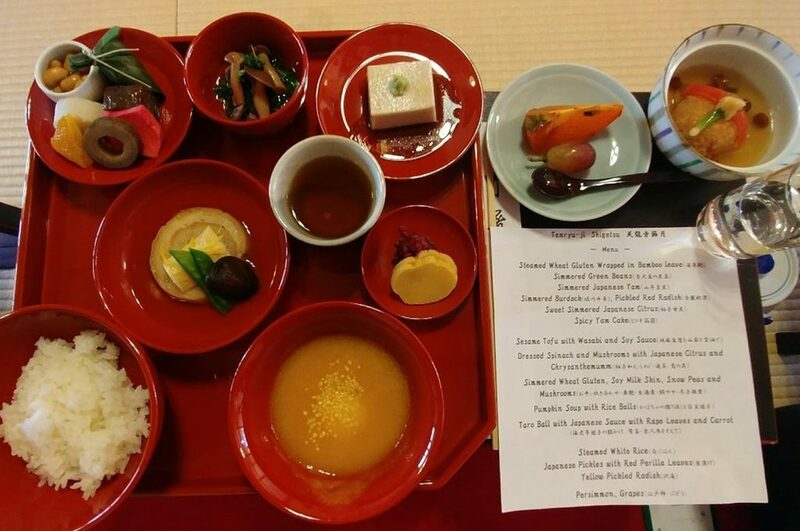 Kaiseki cuisine places focus on simple yet flavorsome food, and due to the number of different dishes included in a set, ingredients could total up to 80 at any one time. It is the complexity of preparation yet highly simplistic display and taste of this cuisine that draws curiosity and interest from people all over the world to try it. Much of the kaiseki experience revolves around the atmosphere in which you dine as well. In ryokans, most will seat you in a small, tatami-mat room whilst kimono-clad employees quietly shuffle in and out to wait on you. It is truly something unique and different, and for those of you who revel in gastronomical experiences, this best food in Kyoto is a must. Hyotei is one of Kyoto’s three-star Michelin restaurants. It Is a classy, attractive establishment, hence being on the pricier side, however, it has always stayed true to its philosophy of serving only traditional Kaiseki cuisine. Access: Head to Keage Station. It is a 10-minute walk from there. By now, you may have started to see a slight trend in that traditional Japanese cuisine often revolves around preparing and presenting several small dishes to make up one meal. Obansai Ryori is one such style, but it differs from others mostly in the way it is cooked: it is the traditional home-style cooking of Kyoto. 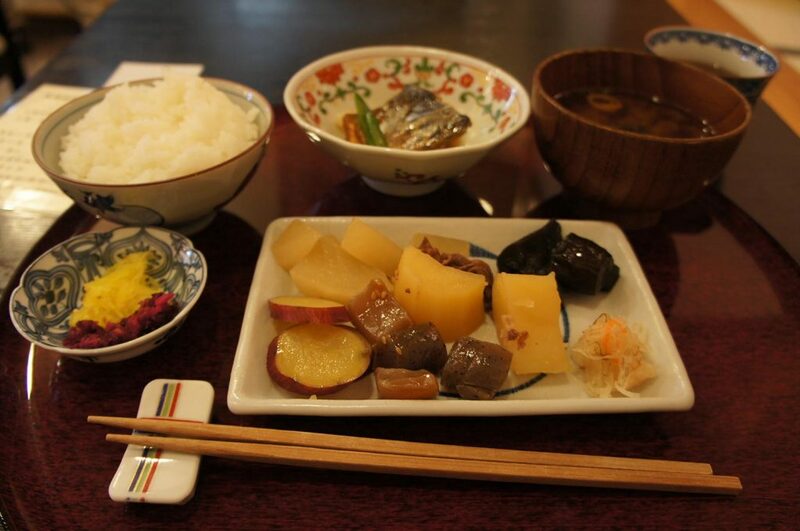 There is no one main dish included in Obanzai Ryori, rather, local seasonal produce is what’s used at any given time. There is a heavy emphasis on vegetables, and all dishes are prepared with the notion that there are no parts of an ingredient thrown away – everything is accounted for in the meal. Whilst with Kaiseki Ryori, we note that there is a due responsibility to eat in a quiet, respectable manner, Obanzai Ryori is different in that, just as there is a homely taste and style to the way of cooking, the dining experience is more upbeat and merry, and the variety of dishes will leave your soul nourished and thankful. Menami has been serving authentic Obanzai Ryoshi for more than 70 years. It is amongst one of the most popular with the locals and tourists alike. Their ingredients are always fresh, and service is always welcoming. Access: Head to Sanjo Station. It is a 5-minute walk from there. Also known as kyo-gashi, this refers to the traditional Japanese sweets that were made for the Imperial family and the nobility in Kyoto to enjoy with their tea. Due to the high status of the recipients, the process of creating these were almost treated like an art form. 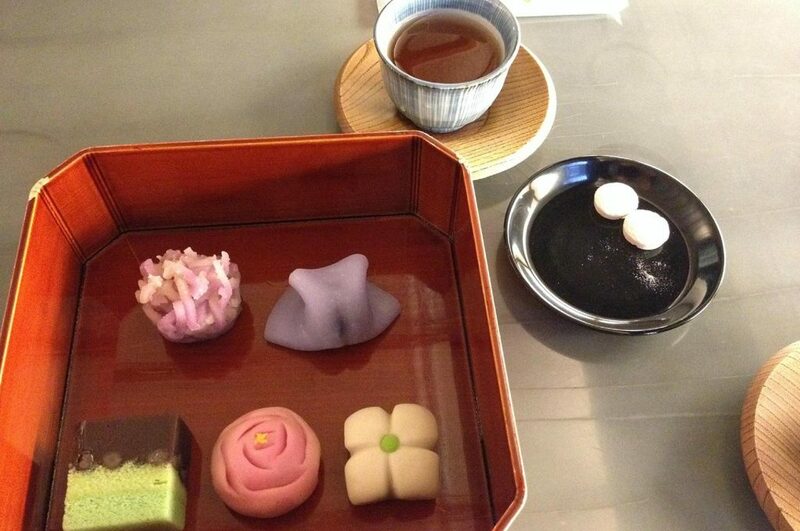 Of course, ‘wagashi’ itself means Japanese sweets and obviously can be enjoyed throughout Japan in many regions, but the Kyoto-created delights have that extra hint of detail and care in the craftsmanship, the flavoring and texture, and the presentation. 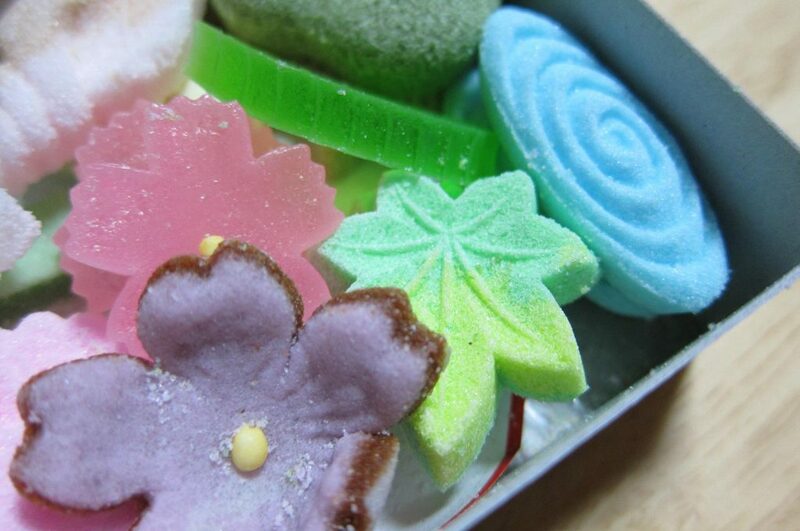 Given the amount of effort poured into creating these special sweets, its been said that kyo-wagashi is to be enjoyed with the eyes, mouth and ears. Unlike western sweets which mostly contain processed sugar, kyo-wagashi’s ingredients list remains just as short but is worlds away in terms of quality. Such things as beans, rice flour, and agar gar (natural vegetable gelatin), as well as fruits such as persimmons, chestnuts, and sweet potatoes are used. For the higher quality versions, traditional flavorings include kinako (roasted soy nut flavour), kuromitsu (raw brown sugar) and matcha. Whilst sugar is sometimes added as well, it acts merely as a supporting ingredient, not as the base. There are hundreds of stores in Kyoto all specialising in their own unique versions of kyo-wagashi, so if you have a sweet tooth, you’ll have a lot of fun sampling all of these! Remember, it’s very rare that you will come across kyo-wagashi outside of Kyoto, so don’t think twice about buying them to bring home! They also make for great souvenir gifts. People have travelled far and wide to sample Kagizen Yoshifusa sweets. This is an extremely popular store amongst the locals. Once you purchase your sweets, if you decide to have it there, you will also get a cup of thick matcha tea which comes with free refills. What a bonus! Access: Head to Gion Shijo Station. It is a 5-minute walk from there. The authenticity of the above-listed foods can only be attested in Kyoto, so if you’re spending a few days in the city of Old Japan, make sure to include a few of them in your itinerary. You won’t regret the experience like no other! If you like our article about the best food in Kyoto, you can check out our recommendations of the Traditional Japanese Food you have to try in Japan. Are you planning to visit Kyoto soon? 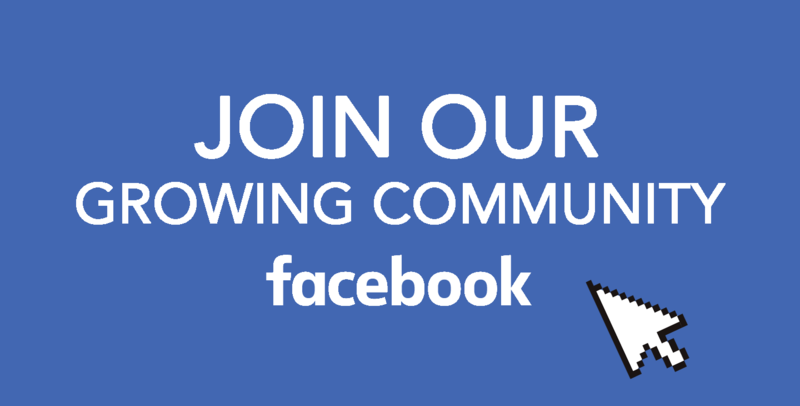 Share your plans with our growing community on our Facebook group. You can also follow us on Facebook, Instagram, and Pinterest.